Harrison Burton and the Hunt Brothers Pizza Racing team head to Texas Motor Speedway in Fort Worth for Friday’s Vankor 350. It will be Burton’s second trip to the 1.5-mile quad oval. He qualified eighth and finished sixth in the first NASCAR Gander Outdoors Truck Series mile-and-a-half start of his career last November. In two NGOTS starts on mile-and-a-half tracks in 2019, the second-generation racer boasts an average starting position of 2.5 and average finish of 6.5. With his 11th-place finish at Martinsville (Va.) Speedway in the Truck Series’ last stop, Burton fell three spots to fifth in the NGOTS championship standings, but still only finds himself nine tallies behind points leader Stewart Friesen. The talented teenager leads the Sunoco Rookie of the Year standings by 31 points over Sheldon Creed. Burton has earned the Sunoco Rookie of the Race Award in each of the last three events on the schedule. Veteran crew chief Mike Hillman Jr. and the No. 51 team that worked with Burton for his eight-race schedule in 2018 have moved over to guide the 18-year-old’s rookie campaign in the No. 18 Tundra this year. Hillman Jr. is a two-time champion crew chief in the Truck Series. He guided Todd Bodine to Toyota’s first-ever National Series title in 2006 and the duo won the championship again in 2010. Burton has produced one pole, five top-five and nine top-10 finishes resulting in an average finish of 8.3 in 13 starts with Hillman Jr. calling the shots since he joined KBM in October of 2017. Hillman Jr.’s drivers have posted six wins, 10 top-five and 12 top-10 finishes resulting in an average finish of 10.4 across 23 starts at Texas. His first five wins in the Lone Star State came with Bodine at the wheel, but his most recent win came in June of 2013 with Jeb Burton, Harrison’s cousin, driving. Hunt Brothers Pizza will serve as the primary sponsor of the No. 18 Tundra Friday night. With more than 7,500 locations in 28 states, Hunt Brothers® Pizza is the nation’s largest brand of made-to-order pizza in the convenience store industry. Hunt Brothers Pizza offers original and thin crust pizzas available as a grab-and-go Hunk perfect for today’s on-the-go lifestyle or as a customizable whole pizza that is an exceptional value with All Toppings No Extra Charge®. Headquartered in Nashville, Tennessee, Hunt Brothers Pizza is family owned and operated with more than 25 years of experience serving great pizza to convenience store shoppers through its store partners. Safelite AutoGlass, the nation’s largest provider of vehicle glass repair and replacement services, will adorn the hood of Burton’s Tundra for 19 of the 23 events on the NGOTS schedule in 2019. They will be back onboard the No. 18 Toyota when the Truck Series resumes action at Dover (Del.) International Speedway on May 3. How is your comfort level on mile-and-a-half tracks? After growing up on short tracks, what do you find toughest about racing at mile-and-a-half tracks? What is your topping of choice for your Hunt Brothers Pizza? Across 19 career NGOTS starts has collected one pole, 77 laps led, five top-five and nine top-10 finishes resulting in an average finish of 10.3. 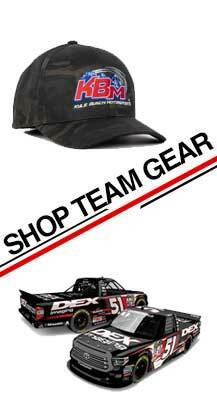 KBM-56: The Hunt Brothers Pizza Racing team will unload KBM-56 for Friday’s Vankor 350 at Texas. The Tundra was brand new at Atlanta (Ga.) Motor Speedway, when Burton qualified second and finished inside the top three in each of the first two stages before he got shuffled back on a late restart and finished eighth. KBM drivers have collected five wins, two poles, 716 laps led, 12 top-five and 27 top-10 finishes resulting in an average finish of 10.6 across 41 starts in the Lone Star State. Owner-driver Kyle Busch has collected two of his team’s wins (2010 & 2014), Erik Jones earned the victory in November 2015, William Byron took the checkered flag in June of 2016 and Christopher Bell went to Victory Lane in June of 2017.